Tour Package is a child theme of Travel Agency WordPress theme. It is a free WordPress theme to create travel booking website for tour package and travel companies. You can add trips, destinations, and trip types, feature travel activities, highlight your specialties and allow visitors to book the trips. The stunning design combined with modern CSS effects and animation will make your visitors feel like they are already on a trip. Tour Package WordPress theme is speed optimized, SEO-friendly and mobile-friendly. You are using WordPress to build your travel and tour company’s travel booking website for free without writing a single line of code. You are looking for a free web template to display the travel services (destination, trips, activities, adventures, etc.) 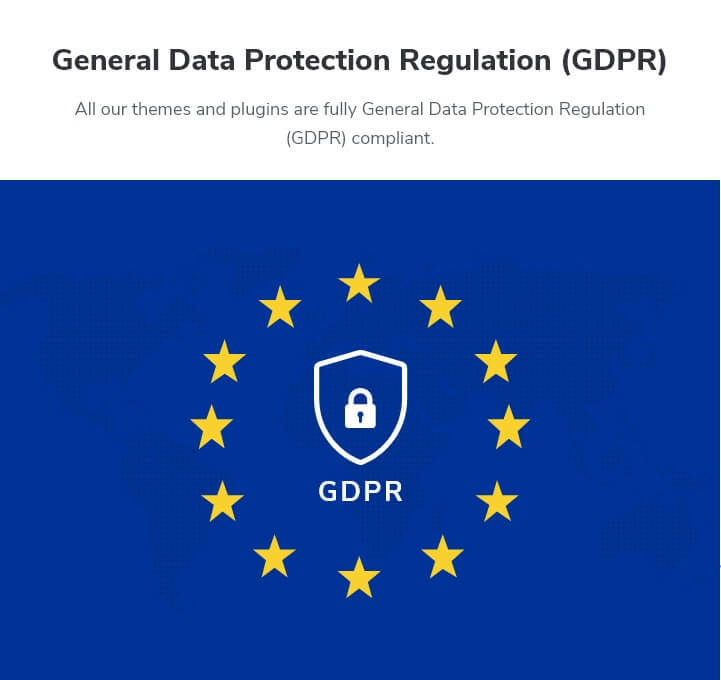 on your website. You want a clean, responsive, SEO-friendly, and speed optimized website for free. More than 50% Google searches are done on mobile devices. Tour Package is a fully responsive mobile friendly WordPress theme. The theme automatically adjusts itself to screen sizes of various mobile devices and tablets so that your website looks flawless on every device and offers smooth user experience. You can reach a wide range of customers with the fully responsive design. Tour Package WordPress theme passes Google mobile-friendly test. This means better rankings in search results. You can import all the images, text, and settings from the live demo of Tour Package theme with a click for free because we believe you should spend more time on your venture than on setting up your website. Tour Package WordPress theme is a speed optimized WordPress theme, which means your website will load faster and your visitors will have a smooth browsing experience. The theme, with its speed, will help you keep your customers and get new leads easily. Tour Package is fully compatible with WP Travel Engine plugin, which is a travel booking WordPress plugin. WP Travel Engine is a powerful plugin that allows you to easily create custom trips with detailed itinerary and FAQs. You can create trips to multiple destinations and add multiple activities to the trip. The theme also allows your visitors to book the trip that they like right away. With Tour Package theme, you can add a Call-to-Action (CTA) on the banner so that visitors can take a call to action. This will help you get more travelers through your website. 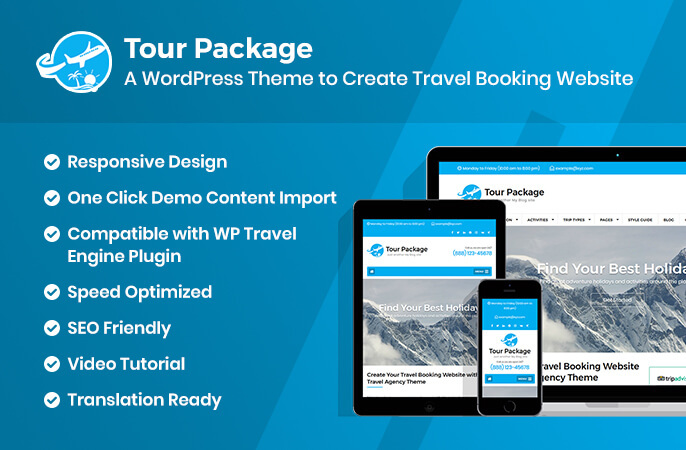 You can now get started with a complete, powerful travel website in no time with our step-by-step video documentation of Tour Package WordPress theme. You can create your Tour Package’s website from scratch with the video guide. Tour Package comes with an extensive theme documentation to help you setup your website. Just follow the step by step guidelines on the documentation and your website will be ready in no time. We won’t charge you for using Tour Package WordPress theme. And, there’s no catch! Tour Package allows you to display your social media links on your website so that your visitors can find you on social media. Social media on your website will also help you boost your business’ engagement. The theme also supports Russian and Chinese social media like OK, VK, Zing, and others. You can add unlimited social media on your website. Tour Package theme is fully compatible with WooCommerce plugin. You can easily create a platform to sell merchandises on your website. Tour Package has ample space for widgets. You can add and manage the widgets you require without compromising the design of the theme. Widget ready design and code allow you to easily customize your website as you desire. Tour Package is clean and has an eye-catching, modern design that will mesmerize your visitors. The theme will create a good long-lasting impression on your users. Tour Package is cross-browser compatible, which means the theme will work seamlessly with the popular web browsers. The theme is tested on Chrome, Firefox, Internet Explorer, Edge, and Safari. The theme comes with 3 custom made widgets. You can easily display your popular trips, recent trips, and featured trips using the custom widgets. Tour Package has a breadcrumb option that can help your visitors to navigate easily on your website so that there is maximum engagement. With the perfect font type, size, spaces, and contrast, Tour Package makes sure that your content is easy on the eye and your visitors enjoy reading what you have to say. Don’t let the language barrier come between you and your website. Tour Package theme supports localization so that you can use the theme in your local language. Do you use right-to-left (RTL) scripts like Arabic? Well, worry not! Tour Package supports both LTR and RTL languages. You can write content with confidence! You can easily add your own logo on your website using Tour Package theme. Want to modify some CSS effects or change color of a section? Tour Package allows you to easily add CSS effects right from the customizer.